The experts in surf park liners, with expertise in recreational and decorative ponds. Layfield is the expert in surf parks & recreation liners with additional expertise in recreational and decorative po nds. 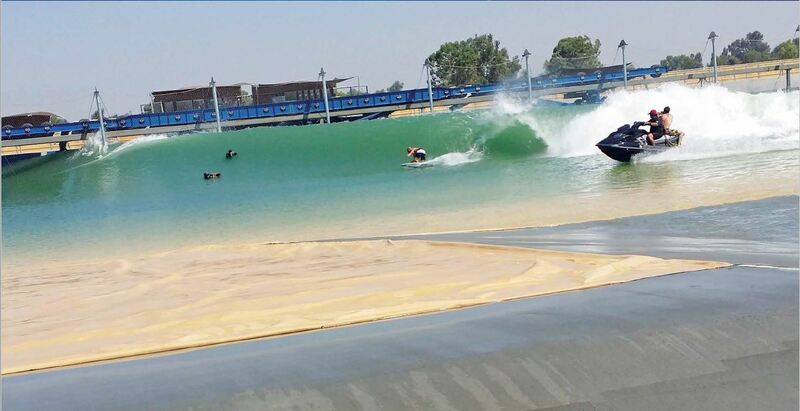 Layfield constructs surf park recreation geomembrane liners using Reinforced geomembranes. Reinforced geomembranes have a fiber scrim to increase its strength and minimize expansion and contraction. Due to the way these geomembranes are engineered, they can be more flexible and durable than unreinforced liners. Reinforced geomembranes have many benefits including expansion / contraction is almost eliminated, higher tesnile strength, higher seam strengths and higher puncture resistant with a 30 year weathering warranty. A couple of examples are Burke Industries (CSPE) and Seaman Corporation (XR5). Burke Industries CSPE is an excellent floating cover and lining material with one of the best weathering warranties available. Chlorosulfonated Polyethylene (CSPE) geomembrane and cover materials are highly UV stabilized and are used extensively in municipal water containment. CSPE has been used as a lining and cover material for more than 30 years, and has shown exceptional durability and longevity in potable water facilities. Layfield has extensive North American and international experience with the design, fabrication, and installation of CSPE lining and floating cover systems. CSPE materials are available in a number of styles and colors with variations in the number of plies, the type of supporting scrim, and the overall thickness of the liner. Layfield Environmental Containment is a vertically integrated company involved in the manufacturing, fabrication, installation, and maintenance of high performance geomembranes, floating covers, and specialty geosynthetics. Contact Layfield for additional information on Surf Parks & Recreation Liners.